We entered Bulgaria in the north about in the middle of the country. We are headed to the Madara Horseman, the symbol that is on every Bulgarian coin. 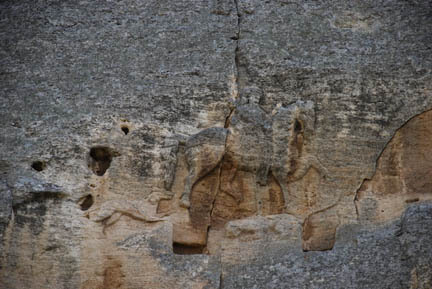 This horseman was carved into the cliff face in the 8th century. It consists of the horseman and a dog running behind and another animal laying under the horse's feet, perhaps some game they were hunting. The figure is about 30 feet high and about 50 feet above the base of the cliff. Then we climbed the trail to the top of the cliff to see the fortress ruins. Kathy is on the trail, just barely in the sun, right in the center of the picture. The fortress ruins were just the base of some stone walls that ran from the cliff in an arc back to the cliff enclosing an area that could be defended. They were not very interesting and definitely not worth the climb (400 feet, over 100 meters), but the view was fabulous. The bike is parked to the left of the red roofed building. 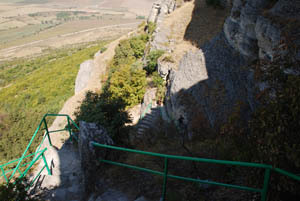 The horseman is directly below the fortress. 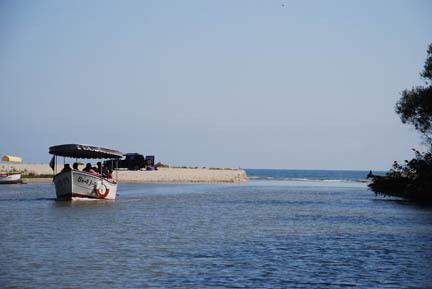 From there we headed to the Black Sea and a campground near the Kamchea River delta that had boat rides. We arrived at the very rundown campground, (the only one) registered for two nights and paid. We were told to go around the corner and find a place anywhere amongst the little bungalows, so we headed over there. We were soon stopped by a young man who said he and his group had rented the whole entire campground. He had organized this meditation seminar and reserved it all. He and I went back to the gate and he talked to the owners, in Bulgarian, and the result was that they would not give us our money back. So he and I went back to the bike and we all discussed options. He wanted complete silence for the meditation seminars. They were not using all the bungalows so we agreed that we would stay near the first bungalow, use its bathroom and be as quiet as possible. He was very nice about it and we are usually pretty quiet, so it all worked out, I think. When we left two days later he was very nice as we said goodbye. The Kamchea River delta is a protected area, but has a dozen or so of these boats that ply the river from the mud bar at the Back Sea to about a half kilometer upstream where it gets too narrow to continue. Not really much of a ride. We also walked on the beach and looked at the filthy water. No swimming for us. The Black Sea is behind the white waves breaking on the mud bar. We were in a boat similar to that one. While having a beer on a riverside deck we met a British couple. We talked with them for quite a while. As we were leaving they wanted to take a picture of the bike. One interesting thing that we have noticed is that we are our own tourist attraction. We go to a tourist attraction and people gather around us and take pictures as if we are a tourist attraction too. This has happened in every country. This can be either the locals or tourists from other countries. 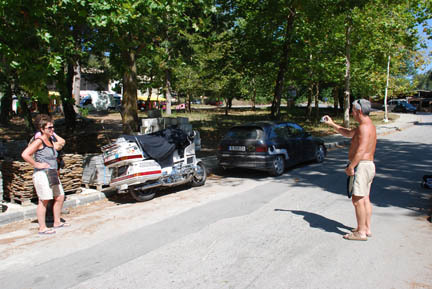 The man at the campground and the British couple both recommended Nesebar. It is an ancient town on a rocky point in a bay of the Black Sea. 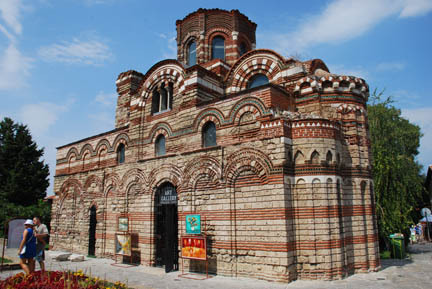 It was started in the Early Byzantine period of the 4th and 5th centuries as a fortress. This is just one of many churches in various states of ruin. Today the town is a complete tourist trap. 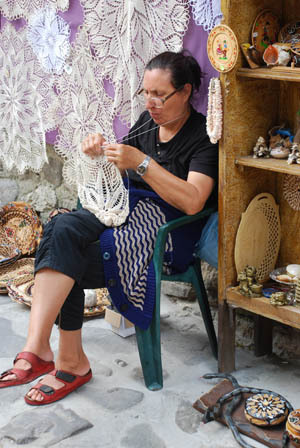 It has booths selling tourist junk (made in China) and others selling local handicrafts like the lace this woman makes and sells. And in the cobblestoned town square there were car rentals. 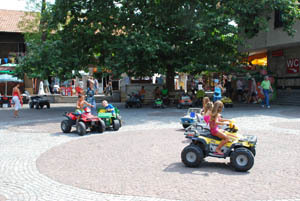 Battery operated cars for the younger drivers. The youngsters were having a great time, some of them thinking they were on Bumper Cars and others just driving around with big grins on their faces. From Nesebar on the coast we headed over a series of mountains and up valleys. We had lunch at a restaurant overlooking this reservoir with its fish farm village floating below. We don't have any idea what they raise there but they are in active use. Notice the trees that have started growing in the walkways between the pens. 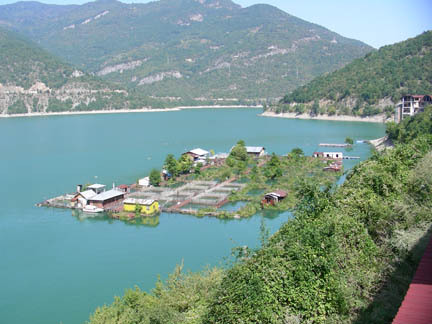 We are now near the town of Goce Delcev in southwest Bulgaria in the Hotel Baroto. Campgrounds are very rare in both Romania and Bulgaria so we have spent more nights in hotels, of varying quality and cost, than we have camping. We saw this one and pulled in for the night and found it to be a good value for the cost. The next day we left and went up to the pass on the way to Greece and the engine quit, very low battery. There is a cheap, rundown hotel in the pass and we got the bike restarted and into the parking lot. We rented a room and got the computer out, read the file I made of the repair manual and started checking the charging system. The alternator seems to be dead. 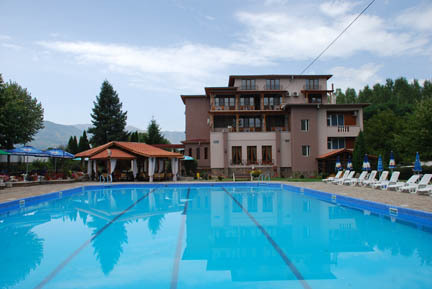 We decide to return to the Hotel Borato because it is near a town. We pulled the fuses to all non-essential lights, put the bike back together, use the room to clean up. Then we packed up and started down the mountain to the valley bottom. I am leaving the engine off to save the little battery we still have. 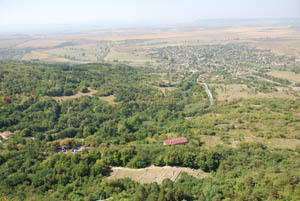 It is downhill all the way through Goce Delcev and to the hotel out in the valley, about 20 km. I alternate the hand and foot brakes to avoid overheating and losing all braking as we coast along. Near town I start the engine and run it through town for added control and because the road is almost flat now. About 500 meters (yards) from the hotel it quits again and we push it to the hotel, still a little bit downhill so it is not too bad. We are hot and exhausted as we reenter the hotel and get a room. I do some more diagnostics on the bike and walk to town to see if we can rent a car. I get an old clunker of a rental and return and pull the alternator and take it back to town. A man in a repair shop takes it apart and replaces a module inside and declares it fixed. I put it back in, run the diagnostics and the problem is the same, no charging of the battery. The hotel has WI-FI and I get online and find the phone number for the contact at the GoldWing Club of Greece. He is in Athens and is glad to help. He will order for me a new alternator and have it delivered to the nearest Honda dealer for pickup, about 150 km. (100 miles) from me in Greece. It should be there on Wed. or Thur. (it is now Saturday). So we will just kick back by the pool until then and then I'll rent the car again and go get the part. I hope there are no problems getting into Greece in a Bulgarian rental with a US passport. We'll let you know how it goes someday. There are worst places to be stranded! Hopefully Athens is next on our tour.